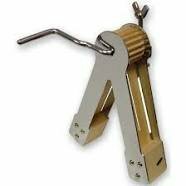 A ratchet, also called a noisemaker is an orchestral musical instrument played by percussionists. A gearwheel and a stiff board are mounted on a handle, which rotates freely. The player holds the handle and swings the whole mechanism around or can be used with mount for use with drum kit.